I got a great, but highly disturbing, email today. It was from my friend M who was out for a stroll on the seawall in West Vancouver. Anyway, the seawall is generally packed with people cycling, jogging, or simply walking along, breathing the fresh salty air while enjoying, say, a latte in a disposable cup. What? . . . . You don’t think nature goes with disposable cups? I’m pretty sure that’s not the reason she took it. I mean, it’s only funny because it’s ridiculous. And it’s only ridiculous because we all know it’s not really acceptable. Don’t we? So, what do you think? Is it an appalling symbol of consumerism and waste? Or is it no big deal? Just a sign of the times? 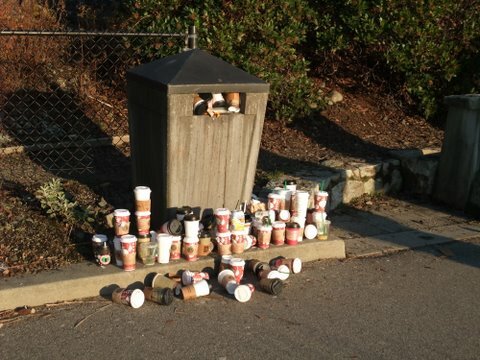 Maybe people should get credit for trying not to litter and putting their cup as close as possible to the nearest garbage can? Maybe not. Thanks for the photo M.
could be time to put a sign on the bin… if this bin is full, pack your recycling and trash to the nearest available one. Pack it in, pack it out! This is embarrassing enough to break me into using a reusable mug from now on because my cup’a’day habit is disgustingly wasteful. I am ashamed. I can’t take credit for any of those cups, but I’ll try harder to produce less waste. Forward your post plus photo to the Vancouver paper and invite locals and municipal authorities to comment. Invite a sloution! What a disgusting waste of our forests. It’s our humble attempt to create some engaging messaging that will convince the public this is something to be embarrased about. Contest deadline is end of February so pass the word to your friends and colleagues! Oh my word, what a horrible sight. What strikes me about it too is how carefully most people have placed them around the bin, in a very neat way. The irony! Definitely a big deal. The place is too beautiful to be destroyed just because of latte cups and other waste. Definitely. Send it to local newspaper/s or wider! Can these be recycled ? Who sells them? Could at least a recycling bin be put there?